Freeze fracture through the plasma membranes of adjacent cells. The fracture splits membranes through their hydrophobic core of lipid bilayers. At this high magnification, the fracture has jumped several times exposeing alternating P- anf E-faces. P-Face (or protoplasmic face; cyan) - most proteins (or complexes of proteins) remain embedded in the inner half of the plasma membrane adjacent to the cytoplasm. The P-face of the bottom plasma membrane was exposed by the fracture. E-Face (or extracellular face; yellow) - fewer particles are found in the outer half of the plasma membrane adjacent to the extracellular space. 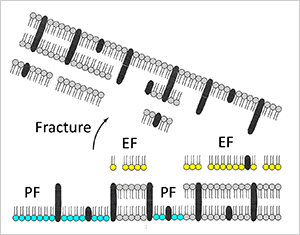 The E-face of the top plasma membrane was exposed by the fracture. Note: It is not possible to view both the P- and E-faces of one membrane in the same specimen.